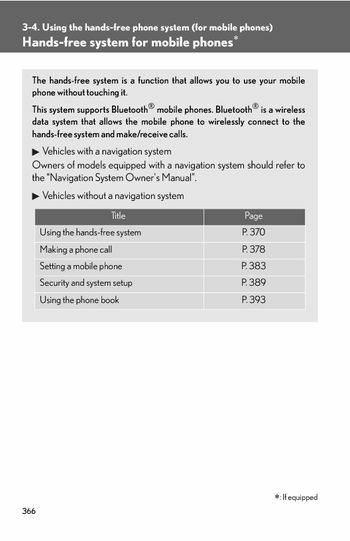 The hands-free system is a function that allows you use your mobile, this system supports Bluetooth® mobile phones, data system that allows the mobile phone to wirelessly connect, owners of models equipped with a navigation system should refer. Conditions under which the system will not operate, ● If using a mobile phone that does not support Bluetooth®, ● If the mobile phone switched off, ● If the mobile phone not connected. ● If the mobile phone's battery low, ● If the mobile phone is behind the seat or in the glove box console box, ● If metal is covering touching phone, ● The audio system and voice guidance are muted when making call. ● If both parties speak at the same time, it may be difficult hear, ● Try to face toward the microphone as much possible when speaking, ● In the following circumstances, it may be difficult to hear other party, when the air conditioning is blowing directly microphone. When the air conditioning set high, be sure to initialize the system to prevent personal data being improperly, ● If the incoming call volume is overly loud, an echo may be heard, compatible with HFP (Hands Free Profile) Ver. If your mobile phone does not support HFP, you cannot enter Bluetooth®, this device complies with Part 15 of the FCC Rules and RSS-Gen IC Rules, operation is subject to the following two conditions: (1) This device may not cause, harmful interference, and (2) This device must accept any interference received. Including interference that may cause undesired operation, changes or modifications not expressly approved by party responsible, compliance could void the user's authority operate equipment, exposure limits set forth for uncontrolled equipment and meets the FCC radio frequency (RF) Exposure Guidelines in Supplement C to OET65. Very low levels of RF energy that it deemed to comply without maximum permissive, (excluding extremities: hands, wrists, feet legs), this transmitter must not be co-located or operated in conjunction with any other, to prevent damage mobile phones. Do not leave mobile phones in the vehicle, become high, resulting in damage phone, using the hands-free system (for mobile phones), the voice guidance volume cannot be adjusted using button. Operating the system using voice commands, by following voice guidance instructions output speaker, voice, commands enable to the operation of the hands-free phone system without the need to check display operate, operation procedure when using voice commands. Press the talk switch and follow voice guidance instructions, auxiliary commands when using voice commands, the following auxiliary commands can be used when operating, cancel”: Exits hands-free phone system. Repeat”: Repeats the previous voice guidance instruction, go back”: Returns previous procedure, help”: Reads aloud the function summary if a help comment is registered selected function, using the hands-free phone system first time. Before using the hands-free phone system, it is necessary register, mode automatically when starting the system with no mobile phone registered, press the off-hook switch talk switch, the introductory guidance and phone name registration instructions. Select Pair Phone” using voice command, register a phone name by either following methods, a voice guidance instruction to confirm input heard.